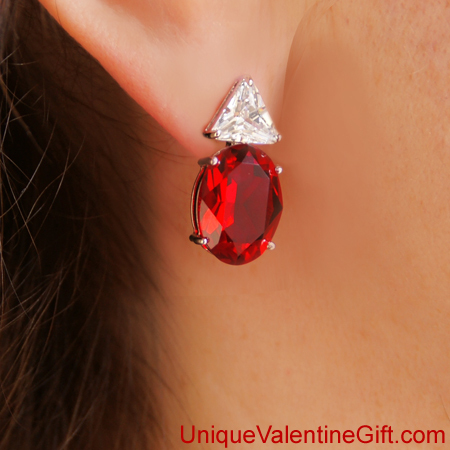 UniqueValentineGift.com presents the Carmen Lucia Ruby Earrings. These magnificent earrings are a stunning homage to the legendary 23.1 carat Burmese ruby ring which was given by Dr. Peter Buck to his wife Carmen Lucia Buck. These earrings are crafted after what is considered the finest example of a ruby on public display, anywhere. Curator Jeffrey Post, stated when he first saw the stone, that it "took his breath away." Show your special woman you find her elegance and beauty as enchanting as the world's finest ruby. This is an extremely unique item she will be proud to wear anytime and anywhere. The original is priceless, but this gift is not. All items are insured and delivered to your home by the United Parcel Service. UPS is committed to doing "absolutely, positively" whatever it takes to deliver your order to you.